Moschino has launched Pink Fresh Couture, a new flanker to 2015's Fresh Couture. With fruity floral notes of pink Jacinth, pink Grapefruit, crunchy Pomegranate & fresh Cassis, the new fragrance elevates spring cleaning to haute couture! 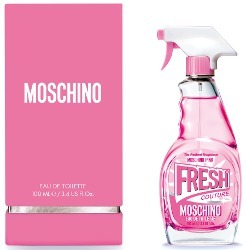 Moschino Pink Fresh Couture is available in 100 ml Eau de Toilette, and possibly other sizes as well. Ai yai yai! I’ve yet to try the original one! Get cracking! They’ll be doing purple before you know it.